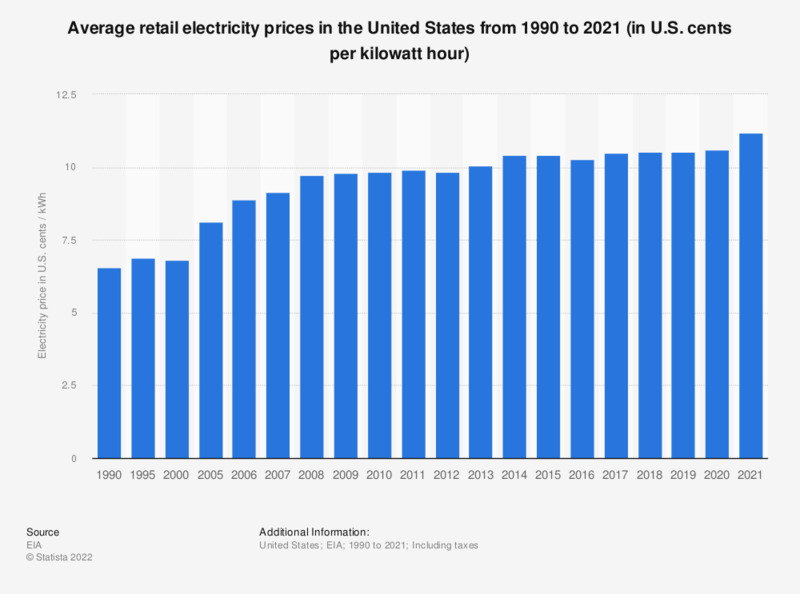 This statistic reflects the average retail price of electricity in the United States between 1990 and 2018. Here, the average retail price of electricity was at 10.58 cents per kilowatt hour in 2018. A ranking of the largest electric utilities companies in the United States can be found here as well as a ranking of global electricity prices in select countries. When Thomas A. Edison developed a system to generate and distribute electricity in order to market his greatest creation, the electric light bulb, he would have known little about the dramatic impact his invention would create on civilization 130 years after the inauguration of the world’s first power station on Pearl Street in Manhattan, New York. In 21st century America, electric power is omnipresent in peoples’ lives, as electricity is powering our factories, shops, homes - and even cars. It goes without saying that electricity consumption has to be paid for, and, naturally, people are worried about the size of their electricity bill. On average, retail electricity prices in the United States changed little from 9.90 cents per kilowatt hour in 2011 to 10.58 cents per kilowatt hour in 2017. However, while power rates in the industrial and commercial sectors increased only moderately between 2011 and 2017, residential electricity customers were charged 12.9 cents per kilowatt hour in 2016, up from 11.72 cents per kilowatt hour in 2011. The rising prices are justified by the costs of power production and power grid maintenance. Although the production cost of electricity generated from coal, natural gas and nuclear sources remained relatively flat, the integration of renewable energy sources, investments in smart grid technologies, growing peak demand and power blackouts caused by the vicissitudes of nature continued to trouble the electric utility industry in the recent past. The rates of U.S. electricity prices can also vary widely, with Hawaii residents experiencing some of the highest rates in the country. According to the source, prices are not adjusted for inflation.